I can assure you that each time I delve into new DIY things does always go as planned. My next quest was how to replace kitchen cabinet hardware. I was so excited about this project, I think I left my head behind and I made purchases of knobs initially that was not going to work. How does the saying go “best-laid plans of mice and men.” Trust me I planned my time, and thought about every step, but never considered one of the most important pieces to all of this, I will share that with you shortly. 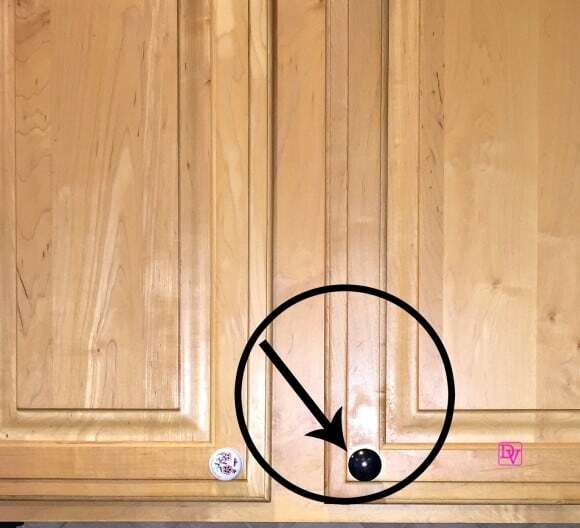 This task of how to replace kitchen cabinet hardware is all about attention to detail, getting the look just right, and being able to love the blended look of a knob as it fits into the kitchen decor. I hit highs and lows in this project but the end results look great! Here’s my DIY of how to replace kitchen cabinet hardware as I lavishly live my life out loud! You will hear me refer to knobs as hardware, pulls, handles, and in fact, they are all these things, so don’t let the guys in the big retail chains intimidate you. What I dislike most about DIY projects is not knowing what to refer to something as, but I Google, ask, talk to my husband, and visit the large DIY retailers and understand what I am looking for. This particular adventure led me down a different path, because I got so focused on color, that I forgot a very simple piece of the project which created its own chaos, but I learn through my mistakes and then share the info with you! My error created another trip to the store (ok, multiple to locate all the knobs) and of course the time and effort I spent trying to correct a situation that could not be corrected –> refer to the video below. Realizing I am not the first person to trip over this situation, I decided to share it with you so you don’t have the same problem occur as we all seem to get tunnel vision when we head into new projects, so here we go. Before I even thought about changing the knobs I cleaned the cabinets. When was the last time you wiped your cabinets from top to bottom and treated them to wood conditioner? I had not done it in a while and I am ashamed to say they were a mess. I cook all the time, but never realized the mess that was actually there! Ugggg, bust out the rubber gloves. 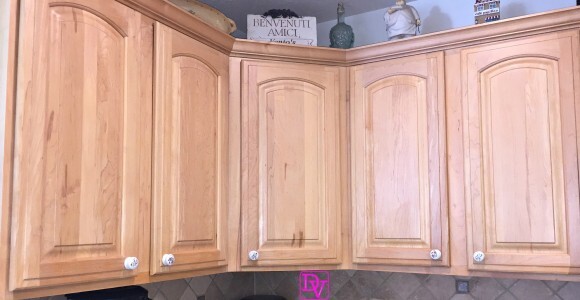 At this point I’d like to give a good shout out to my friends at ENDUST -while they by no means supported this post I do have to tell you if you want to get your kitchen cabinets clean and shiny and looking like knew this was definitely the best solution. Do you make sure to use one cloth to apply and 1 cloth take it off. With the cleaning out of the way, I got my tools out, all of the knobs out of their package and then I began. Now little discussion about the kitchen cabinet hardware actually let me what let you watch my video I think that will give you a bit more of an explanation of what exactly went wrong with my initial DIY. See now you saw what I did not pay attention to that flush mounting made all the difference in how the look could be versus what we ended up with. I need to pay a bit more attention to detail as it was not simply just taking down a piece of hardware and putting a new one up. Where the arrow is you can clearly see the old knob mark, which was driving me nuts. I scrubbed, I cleaned, and I scrubbed some more, it just would not go away, it was pressed in and had been used for 7+ years! This knob is not what I used, I had to get other ones, look closely at the next photo. I also ran into a bit of problem because I needed over 52 knobs for the entire kitchen so we bought out what we could find it one Home Depot and moved onto the next and after I exhausted all of the supplies I had to wait to get the last two further away. The installation itself was a breeze, it took me a screwdriver my hands and just a little bit of time and I made sure to not overextend the tightening mechanism the screw in order to not heard anything or stripped the screw. I chose my new knobs to coordinate with the backsplash because the white ones did not. This was a very easy to do DIY once I got started and got the RIGHT knobs to sit flush on the cabinets. That’s my story of how to replace kitchen cabinet hardware, a very simple DIY with dramatic results! This post contains affiliate links, which means danavento.com may make a commission on the sale if you use the link to make your purchase. This does not change the price of the product. This income directly offsets the cost of web hosting and maintenance so we greatly appreciate your support. The links help you find the best of the best, have fun shopping! Your post is so inspiring. It is s important to change the minor detailing of the house like the door handles, door knobs, etc. Now I am also thinking of changing the door knobs of my kitchen’s cabinets. Thanks for sharing. What a great post you are! This is an excellent and one of the most beautiful articles about how to replace cabinet hardware. Your tips and ideas are very helpful for my cabinet. I read your full article and I know how to replace cabinet hardware. 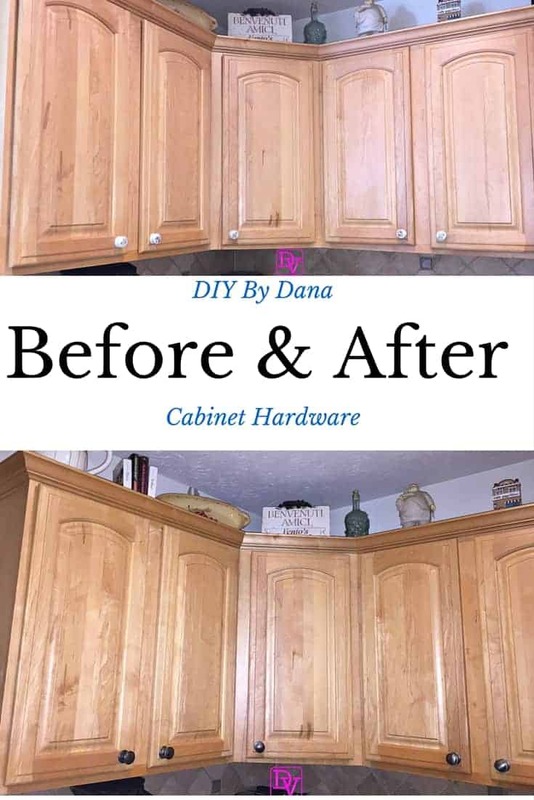 Hopefully, beginners also know about cabinet hardware replacement. you are so creative. I am full of inspired now. Thanks for sharing your post. That’s a very easy and anazing tutorial. Such a small change and great look. Thanks for shaing. These tips could come in handy for us. Will definitely take this into consideration. Looks amazing and super easy to install, my favorite things about a DIY project! The black looks a lot better on the cabinets than the white. Thanks for sharing! amazingly simple and looks great! Great advice for those not so sure about DIY project types. I grew up watching and living with a “Bob Villa” dad so a project like this would be second nature to me. I realize not everyone would know how to change out a door knob and this video would be very handy! We are about to do a redo in our kitchen. Now we just need to agree on the knobs! This is second on the list of kitchen projects we have planned. First we have to repaint all the doors as the paint around the doorknobs has worn away. What fun that is going to be! This is awesome information for people to pay attention to before getting the knobs for their cabinets. It is indeed most people make a mistake doing. Thanks for sharing your experience. It is great how a simple change like switching out cabinet hardware can make such a big difference. Love it. I wish we are a handy people I want to upgrade our kitchen cabinet to cherry wood. This ideas will help us to move forward to our plans. My kitchen cabinets need a makeover. I love the knobs you used. Nicole Escat recently posted..Track your Belongings with your Smartphone! WOW! It’s amazing how such a simple change can make such a huge impact 🙂 LOVE IT! I am renting but do appreciate reading good tips and about good products to beautify the kitchen. I did that before I sold my last house and it was a simple touch that made a big impact! I love how yours came out. That’ great! I replace my cabinet knobs from time to time, too! Wow such a simple change makes such a big difference! I should look into doing this with our old cupboards! Looks great! We did this with all of our kitchen cabinets and drawers a few years ago! Do you want to come over and do mine next 😉 Sometimes little changes are all something needs. Is that funny you can live worlds away and have the same Stuff? Go replace yours! I do like the black knobs so much better. It makes a big difference.